For the traditional Turkish folk songs, see Türkü. Turku (/ˈtʊərkuː/, Finnish: [ˈturku] ( listen); Swedish: Åbo [ˈoːbʊ] ( listen)) is a city on the southwest coast of Finland at the mouth of the Aura River, in the region of Southwest Finland (Varsinais-Suomi). Turku, as a town, was settled during the 13th century and founded most likely at the end of the 13th century, making it the oldest city in Finland. It quickly became the most important city in Finland, a status it retained for hundreds of years. After Finland became part of the Russian Empire (1809) and the capital of the Grand Duchy of Finland was moved to Helsinki (1812), Turku continued to be the most populous city in Finland until the end of the 1840s, and it remains a regional capital and an important business and cultural center. Due to its location, Turku is a notable commercial and passenger seaport with over three million passengers traveling through the Port of Turku each year to Stockholm and Mariehamn. As of 30 September 2018, the population of Turku was 191,499 making it the sixth largest city in Finland. There were 330,192 inhabitants living in the Turku sub-region, ranking it as the third largest urban area in Finland after the Greater Helsinki area and Tampere sub-region. The city is officially bilingual as 5.2 percent of its population identify Swedish as a mother-tongue. The Finnish name Turku originates from an Old East Slavic word, tǔrgǔ, meaning "market place". The word turku still means "market place" in some Finnish dialects. The Swedish word for "market place" is torg, and was probably borrowed from Old East Slavic, and was present already in Old Swedish. The Swedish name Åbo may be a simple combination of å ("river; creek; large stream") and bo ("dwelling"). As this pattern does not appear in any other Swedish place names in Finland, etymologists believe there could be a different explanation. One theory is that it comes from "Aabo", the Finnish rendition of the Russian "Avram" (Abraham), which could also be the origin of the name of the river Aura. There is however an old legal term called "åborätt [sv]" (meaning roughly "right to live at"), which gave citizens (called "åbo") the inheritable right to live at land owned by the crown (å meant at or on in old Swedish, now på). In Finnish, the genitive of Turku is Turun, meaning "of Turku". The Finnish names of organizations and institutes of Turku often begin with this word, as in Turun yliopisto for the University of Turku. Turku has a long history as Finland's largest city and occasionally as the administrative center of the country, but for the last two hundred years has been surpassed by Helsinki. The city's identity stems from its status as the oldest city in Finland and the country's first capital. Originally, the word "Finland" referred only to the area around Turku (hence the title, "Finland Proper" for the region). Although archaeological findings in the area date back to the Stone Age and early literary sources such as Al-Idrisi's world map from 1154 mentions Turku, the town of Turku was officially founded in late 13th century. Turku Cathedral was consecrated in 1300. During the Middle Ages, Turku was the seat of the Bishop of Turku (a title later upgraded to Archbishop of Turku), covering the then eastern half of the Kingdom of Sweden (most of the present-day Finland) until the 17th century. Even if Turku had no official capital status, both the short-lived institutions of Dukes and Governors-General of Finland usually had their Finnish residences there. In the aftermath of the War against Sigismund, the town was the site of the Åbo Bloodbath. In 1640, the first university in Finland, the Royal Academy of Turku, was founded in Turku. Turku was also the meeting place for the States of Finland in 1676. After the Finnish War, which ended when Sweden ceded Finland to Imperial Russia at the Treaty of Fredrikshamn in 1809, Turku became briefly the official capital, but soon lost the status to Helsinki, as Emperor Alexander I felt that Turku was too far from Russia and too aligned with Sweden to serve as the capital of the Grand Duchy of Finland. The change officially took place in 1812. The government offices that remained in Turku were finally moved to the new capital after the Great Fire of Turku, which almost completely destroyed the city in 1827. After the fire, a new and safer city plan was drawn up by German architect Carl Ludvig Engel, who had also designed the new capital, Helsinki. Turku remained the largest city in Finland for another twenty years. In 1918, a new university, the Åbo Akademi – the only Swedish language university in Finland – was founded in Turku. Two years later, the Finnish language University of Turku was founded alongside it. These two universities are the second and third to be founded in Finland, both by private donations. As for architecture in the city, both the body of architectural styles as well as the prevalent way of living have experienced significant changes in the 20th century. While having survived relatively intact throughout the years of war 1939–1945, the city faced increasing changes in the 1950s and 1960s due to rising demands for apartments, the eagerness to rebuild, and most of all the new development of infrastructure (especially increased automobile traffic). The wooden one- to two-story houses that were the dominant mode of building in the city were mostly demolished in the 1950s and 1960s to both enable more efficient building and to ease vehicle traffic. This resulted in the destruction of buildings that were, in later decades, seen as beautiful and worth saving. Some individual buildings remain controversial to this day when it comes to their demolition in the decades after the war. For example, the building of Hotel Phoenix that stood on corner of the Market Square was torn down to make way for a large, multistory apartment building in 1959. The building was significant both for its location and history: having stood on one of the most valuable lots in the city center since 1878, the building had, for example, served as the first main building of the University of Turku. Other buildings whose demolition was seen as scandalous, either already at the time of action or proved to be so in later years, include The Nobel House (subject to the very first photograph ever taken in Finland) and the building of Old Hotel Börs which was built in jugendstil in 1909 by Frithiof Strandell. Located at the mouth of the Aura river in the southwestern corner of Finland, Turku covers an area of 245 square kilometres (95 sq mi) of land, spread over both banks of the river. The eastern side, where the Turku Cathedral is located, is popularly referred to as täl pual jokke ("this side of the river"), while the western side is referred to as tois pual jokke ("the other side of the river"). The city center is located close to the river mouth, on both sides of the river, though development has recently been expanding westward. There are ten bridges over the Aura river in Turku. The oldest of the current bridges is Auransilta, which was constructed in 1904. The newest bridge is Kirjastosilta ('library bridge'), a pedestrian-only bridge built in 2013. The Föri, a small ferry that transports pedestrians and bicycles across the river without payment, is a well known feature of the city. With a population of approximately 300,000, the Turku Region (LAU 1) is the third largest urban region in Finland, after Greater Helsinki and the area around Tampere. 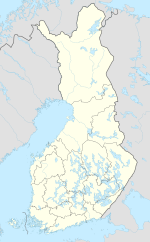 The region includes, in addition to the city itself the following municipalities: Askainen, Kaarina, Lemu, Lieto, Masku, Merimasku, Mynämäki, Naantali, Nousiainen, Paimio, Piikkiö, Raisio, Rusko, Rymättylä, Sauvo, Vahto, and Velkua. A more exclusive definition for the urban area is the city region of Turku with a population around 235,000 consisting of four major municipalities Kaarina, Raisio, Naantali, and Turku. IV District, or Martti, is one of the smallest but most densely populated districts of Turku. The city is divided into 78 districts and nine wards that do not function as local government units. There are, however, some projects that are based on the district divisions, particularly in the eastern part of the city, where unemployment is high in certain areas. The largest populated districts are Varissuo and Runosmäki. By area, however, Kakskerta and Paattinen, formed from former municipalities that were annexed to the city proper in the mid-20th century, constitute the largest districts. As many of the small neighbouring municipalities from the north and south of the city were annexed during the mid-20th century, Turku is today shaped like an elongated pear. The city centre and most of the suburban areas lie in the middle, separated from the less densely populated northern rural areas by the Turku bypass, that forms part of European route E18. Islands such as Ruissalo, Hirvensalo and Kakskerta, forming the southern part of the city, are also sparsely populated and mostly contain summer residences, with the exception of some districts in Hirvensalo which are currently growing into upper-middle-class suburbs. Area of Turku cathedral in autumn. Situated by the Baltic Sea and sheltered by the islands of the Archipelago Sea, Turku has a humid continental climate (Köppen Dfb). Like much of southern Finland, the city experiences warm summers, with temperatures ranging up to 30 °C (86 °F), and relatively cold winters with frequent snowfall. The warmest month of the year is July, with an average temperature of 17.5 °C (64 °F), whereas the coldest month is February. The average year-round temperature is 5.5 °C (42 °F). Winter usually starts in early December, and spring in late March. Precipitation in Turku averages 720 mm (28.3 in) a year. The rainiest month of the year is August, when the city receives on average 80 mm (3.1 in) of rainfall. In April, the driest month of the year, the figure is only 32 mm (1.3 in). The average air pressure at sea level is 101.2 kilopascals (29.9 inHg), with little variance throughout the year. Operational since 1955, the city's weather station is located at an altitude of 47 metres (154 feet) at Turku Airport. At the end of 2004, the Turku region (including the economic districts of Turku and Åboland) had a population of 319,632, out of which 174,824 people lived in the city of Turku. The city's population density is 718 inhabitants per square kilometre. 89.4% of Turku's population speak Finnish as their native language, while 5.2% speak Swedish. The next most widely spoken languages are Russian (1.3%), Arabic (0.6%), Albanian (0.5%). 95.8% of the population are Finnish citizens, and the most sizeable minorities are from Russia, Estonia, Iraq, Iran, Albania, Sweden, Somalia, China, and Denmark. Like all other Finnish cities, Turku does not collect information about the ethnic and religious makeup of its population. MS Oasis of the Seas, the world's largest passenger ship, was built in Turku. The business district in the city's economy is centred on the Port of Turku and other service-oriented industries. The city is also a renowned high tech centre – the Turku Science Park area in Kupittaa hosts over 300 companies from the fields of biotechnology and information technology, as well as several institutions of higher learning that work in closely with the business sector. This cooperative element is seen as a particularly important factor with regards to the city's expected future economic development, as outlined in the Turku Strategy that is published annually by the city council. At least the following major Finnish companies have their corporate headquarters in Turku: HKScan and Hesburger. Other major companies which have operations in Turku include Bayer, Fläkt Woods, Meyer Werft, Orion Corporation and Wärtsilä. As of June 2015[update], over 280,000 people were registered as being without employment in Finland. This put June’s numbers at 10.0 percent of the population, 0.8 percentage points higher than June 2014. Men’s unemployment rate was 10.5 percent and women’s 9.4 percent. Turku Cathedral, one of the most notable historical buildings in Finland. Cultural venues in Turku include several theatres, cinemas, and art galleries, and a city philharmonic orchestra. The city's cultural centre organises a number of regular events, most notably the Medieval Market in July each year. Turku is also the official Christmas city of Finland, and 'Christmas Peace' in Finland is declared on every 24 December from the Brinkkala Hall balcony. The Turku music festival and the rock festival Ruisrock (held on the island of Ruissalo) are among the oldest of its kind in Scandinavia. The city also hosts another rock festival, Down by the Laituri, and one of the largest electronic music festivals in Northern Europe, UMF (Uuden Musiikin Festivaali, "New Music Festival"), in addition to a vibrant nightlife, centred on the Market Square. There are also numerous museums, such as the Turku Art Museum and the Wäinö Aaltonen Museum of Art. The Åbo Akademi University maintains the Sibelius Museum, which is the only museum in Finland specialising in the field of music. Apart from these, there are also several historical museums that display the city's medieval period, such as the Turku Castle, which has been a functional historical museum since 1881, and the Aboa Vetus museum, built in the late 1990s over the 14th century archaeological site. The Luostarinmäki handicrafts museum, converted from residential buildings that survived the Great Fire of Turku in 1827, was the first Scandinavian venue to receive the "Golden Apple" tourism award. Turku is European Capital of Culture in 2011, and the city council has approved numerous projects to boost the city's image in preparation for that status. The Declaration of Christmas Peace has been a tradition in Finland from the Middle Ages every year, except in 1939 due to the Winter War. The declaration takes place on the Old Great Square of Turku, Finland's official 'Christmas City', at noon on Christmas Eve. The declaration ceremony begins with the hymn Jumala ompi linnamme (Martin Luther's Ein feste Burg ist unser Gott) and continues with the Declaration of Christmas Peace read from a parchment roll in Finnish and Swedish. Paavo Nurmi Marathon is run every summer. The city has two football teams playing at the top national level, the Veikkausliiga: FC Inter and TPS. TPS is one of the oldest football clubs in Finland. Both teams play their home matches at Veritas Stadion in the district of Kupittaa. HC TPS of Turku is one of the most successful teams in Finnish ice hockey history. It plays in the Finnish top league, SM-liiga. HC TPS has won the national championship 11 times, the latest being from season 2009-2010. Gatorade Center, formerly named HK Arena, located in the Artukainen district, is used as the venue for HC TPS games. The Paavo Nurmi Marathon is an annual sporting event in Turku, named after the world-famous runner Paavo Nurmi, who was born and raised in the city. Turku Titans is a lacrosse club based in Turku with a relevantly successful history with three silver medals and one gold medal in the national lacrosse league in Finland. The Titans women's team has also had a successful history. The FIL U19 2012 World Lacrosse Championships were also held in the city. Being both a regional and provincial capital, Turku is an important administrative centre, hosting the seat of the Archbishop of Finland and a Court of Appeal. Aleksi Randell has been the mayor of Turku since 2010. The city council of Turku has 67 seats. Following the 2017 municipal election, the council seats are allocated in the following way: National Coalition Party 17 seats, Green League 14, Social Democrats 12, Left Alliance 12, True Finns 5, Centre Party 3, Swedish People's Party 3 and Christian Democrats 1. The current chair of the city board is Minna Arve from National Coalition Party. For a city of its size, Turku has a moderate public transport network of bus routes, which is comparable to the bus network of similar-sized Tampere. The bus network is managed and supervised by the Turku City Region’s Public Transport Committee (FÖLI) (Finnish: Turun kaupunkiseudun joukkoliikennelautakunta, Swedish: kollektivtrafiknämnden för Åbo stadsregion), and is operated mainly by private companies. Bus traffic to and in the neighbouring municipalities of Kaarina, Lieto, Naantali, Raisio and Rusko are also handled by FÖLI. The bus rates are the same when traveling within these municipalities. Rail traffic to and from Turku is handled by the Finnish national carrier, VR. The number of services has fallen and only the railways towards Tampere and Helsinki are now in use. The railway stations currently used for passenger traffic are the Turku Central railway station in Pohjola, and two smaller stations in Kupittaa and the Port of Turku. There is no local rail traffic at the moment, as the city's popular tram services were discontinued in 1972, and the various local railway lines to neighbouring towns and municipalities were all abolished during the late 20th century. However, there are plans for a light rail system in the Turku region in the near future. This system would more ably serve major suburbs of the city such as Varissuo and Runosmäki, as well as the neighbouring cities. The State of Finland has announced plans to support Espoo with 30% of full expenses on a new metro rail, the Regional Council of Southwest Finland is going to use this as a test case for a new light rail network in Turku. The Turku Bus Station and the Turku Central railway station are currently located in different places. The City of Turku is planning to combine these two in a new greater station complex in the near future. This new travel center will consist of a hotel and several shopping estates. This center will connect all public transportation from commuter trains to long distance buses. Turku Airport is located 8 kilometres (5 miles) to the north of the city centre, partly in the neighbouring municipality of Rusko. The airport is served by six passenger airlines, including airBaltic and SAS Scandinavian, and one cargo airline. There are also daily ferry services from the Port of Turku to Sweden and the Åland Islands, operated by Silja Line and Viking Line. These are something of a Finnish cultural tradition (see ruotsinlaiva), and people often travel long distances across Finland to Turku just to take a cruise across the Gulf of Bothnia. The Archipelago Sea boat traffic is handled by, among others, SS Ukkopekka, an old steamship that cruises on the route Turku-Naantali-Turku. Turku is the only city in Finland to have three long-distance railway stations: Turku Central, Port of Turku, and Kupittaa. Turku has a longer educational history than any other Finnish city – the first school in the city, the Cathedral School, was founded along with Turku Cathedral in the late 13th century. The first university in Finland, the "Royal Academy of Turku" (now University of Helsinki), was established in the city in 1640. In 1820, the first school in Finland conforming to the Bell-Lancaster method was founded in Turku with the aim of making primary education more inclusive to the lower classes. Turku is home to about 35,000 higher education students. There are two universities and several "polytechnics" in the town. The Finnish University of Turku is the second largest university in Finland (18,000 students), as measured by student enrollment, and one of the oldest as well, having been founded in 1920. Åbo Akademi, founded 1918 as the second university of Finland, is Finland's only Swedish-language university. Turku School of Economics merged with The University of Turku in 2010, and Åbo handelshögskola, its Swedish counterpart, with Åbo Akademi 1980. The central hospital of Turku, Turku University Hospital, is affiliated with the University and it is used as a teaching hospital. Turku University of Applied Sciences is the second largest polytechnic in Finland after Metropolia University of Applied Sciences. Also Novia University of Applied Sciences and Diaconia University of Applied Sciences have campuses in the town. Turku is one of only two cities in Finland to have an established international school (the other city being Helsinki). Turku International School, located in the eastern district of Varissuo, has been operating since 2003. By an agreement signed between the city of Turku and the University of Turku, Turun normaalikoulu takes care of the teaching in the international school. The most widely read newspaper of Turku, and the area around it, is the daily regional morning newspaper Turun Sanomat, with a readership of over 70% of the population every day. Åbo Underrättelser, a Swedish language newspaper published in Turku, is the oldest newspaper in Finland, having been published since 1824. The free-of-charge Turkulainen newspaper is also among the most popular newspapers, together with the local edition of Metro International and the national evening tabloid Ilta-Sanomat. There are also a number of local newspapers such as Kulmakunta (for the eastern suburbs of Turku, including Varissuo and Lauste), and Rannikkoseutu (for the area around the neighbouring cities of Raisio and Naantali). The first Finnish newspaper Tidningar Utgifne Af et Sällskap i Åbo, in Swedish, was started in Turku in 1771, as well as the first Finnish-language newspaper Suomenkieliset Tieto-Sanomat which was started in 1775. The newspaper Turun Sanomat also operates a regional television station, called Turku TV. The Finnish national broadcaster Yleisradio screens local news, daily from Monday to Friday, for the Southwest Finland (including the regions of Southwest Finland and Satakunta) residents. All Finnish national TV channels are viewable and national radio channels audible in the Turku area. In addition, a number of local radio stations, e.g. Auran Aallot, Radio Sata and Radio Robin Hood are operational. Local public service radio stations are Yle Turun Radio in Finnish language (the regional version of Yle Radio Suomi) and Yle Vega Åboland in Swedish language (the regional version of Yle Vega). Virmavirta, Jarmo (2004). Finland's City of Turku. Keuruu: Otava Publishing. Turun kaupunki (2007). Muutoksen suunnat 3/2007. Retrieved 27 September 2007. ^ "Taajamat väkiluvun ja väestöntiheyden mukaan 31.12.2011". Tiedote (in Finnish). Statistics Finland (Tilastokeskus). 2011-12-31. Archived from the original on 2013-04-12. Retrieved 28 March 2013. ^ a b "Suomen virallinen tilasto (SVT): Väestön ennakkotilasto [verkkojulkaisu]. Tammikuu 2019" (in Finnish). Statistics Finland. Retrieved 15 March 2019. ^ a b "Population according to language and the number of foreigners and land area km2 by area as of 31 December 2008". Statistics Finland's PX-Web databases. Statistics Finland. Retrieved 29 March 2009. ^ "Turku" (US) and "Turku". Oxford Dictionaries. Oxford University Press. Retrieved April 12, 2019. ^ "Turku". Merriam-Webster Dictionary. Retrieved April 12, 2019. ^ a b "Statistical yearbook of Turku" (in Finnish). 2008-07-17. Archived from the original on 2007-09-27. ^ "Christmas City » Turku, the Finnish Christmas City". www.turku.fi. Archived from the original on 2011-07-16. Retrieved 2009-05-06. ^ "Preliminary population 2018". 5 November 2018. Archived from the original on |archive-url= requires |archive-date= (help). ^ "Turku sub-regional unit, Preliminary population by Month". 5 November 2018. ^ "Keskiaika - Suomen kaupungit keskiajalla". Katajala.net. Retrieved 2011-09-16. ^ "Destinations in Finland - Official Travel and Tourism Guide". Visitfinland.com. Retrieved 2009-05-06. ^ Aki Pihlman (2006-09-13). "Varhainen Turku rakennettiin pellolle" (in Finnish). Archived from the original on 2009-01-13. Retrieved 2008-05-06. ^ Andrew Spicer (2012). Lutheran Churches in Early Modern Europe. Ashgate Publishing, Ltd. p. 314. ISBN 978-0-7546-6583-0. ^ route66 (2016-11-11). "Where did the Great Fire of Turku begin?". Visit Turku (in Finnish). Retrieved 2019-04-17. ^ "Turku History". www.triposo.com. Retrieved 2019-04-17. ^ "Kirjastosilta avattiin tulen ja valon juhlassa". www.turku.fi. Archived from the original on 2014-01-14. Retrieved 2014-01-10. ^ "Normal period 1981-2010". Retrieved 12 October 2012. ^ "www.turku.fi » turku.fi » Turku.info » Publications and Reports". turku.fi. 2008-06-25. Archived from the original on 2011-07-16. Retrieved 2009-05-06. ^ "Unemployment rate at 10%, every fifth young person without work". YLE. Retrieved 11 October 2016. ^ "www.uudenmusiikinfestivaali.org". www.uudenmusiikinfestivaali.org. Retrieved 2011-09-16. ^ "Turku Titans history". Turku Titans. Archived from the original on 2011-07-20. Retrieved 2010-07-18. ^ "2012 World Lacrosse". FIL U19 2012 World Lacrosse Championships. Retrieved 2010-07-18. ^ "Turku: Tulos puolueittain ja yhteislistoittain". Ministry of Justice. 13 April 2017. Retrieved 17 April 2017. ^ "Joukkoliikennetietoa" (in Finnish). Turun kaupunkiseudun joukkoliikennelautakunta. Archived from the original on 2016-01-10. Retrieved 2016-01-14. ^ Laaksonen, Mikko. "Raitiovaunulla Naantaliin, Kaarinaan, Runosmäkeen, Varissuolle?". raitio.org (in Finnish). Finnish Tramways Society. Archived from the original on 2008-09-01. Retrieved 2008-07-11. ^ "Turun Sanomat". Turunsanomat.fi. 2006-09-27. Archived from the original on 2007-06-30. Retrieved 2009-05-06. ^ "www.turku.fi » turku.fi » Turku.info » Turku in Brief". turku.fi. Archived from the original on 2011-07-16. Retrieved 2009-05-06. ^ "Turku International School". University of Turku. 15 January 2006. ^ a b c d e f g h i j k l m "Twin Cities of Turku". City of Turku. Retrieved 6 October 2018. ^ "Gdańsk Official Website: 'Miasta partnerskie'" (in Polish and English). Urząd Miejski w Gdańsku. 2009. Archived from the original on 2013-07-23. Retrieved 2009-07-11. ^ "Partner (Twin) towns of Bratislava". Bratislava-City.sk. Archived from the original on 2013-07-28. Retrieved 2013-08-05. Wikimedia Commons has media related to Turku. Wikisource has the text of the 1921 Collier's Encyclopedia article Åbo. The city's official website at http://www.turku.fi/. The website of the tourist organisation Turku TouRing at https://web.archive.org/web/20060202002518/http://www.turkutouring.fi/.